Intuition seems as something strange for many people. They listen about intuition from doubtful sourses told about instrument to "predict" and listen crazy voices and seemed mad in behaviour. But true intuition is something else! It`s the part of everyone`s mind! Behind narrow territories of rationality, highter the instincts and subconsciousness this is the great area of illuminate mind, lighting, the place of brilliant ideas and epiphany, place of deep relaxation and happiness. We all needs it is our time of information`s pressure. Everyone could feel the area of Intuition without a fear to lose rationality. Several ways helps us to make a gentle touch with intuition; such as true love, music, dance, meditation, action, religion wich you could understant and feel by your own experience, arts. Intuition strongly connects with water and all symbols of wter, it`s one of the base structure of our nature both phisical, psychological and also spiritual. 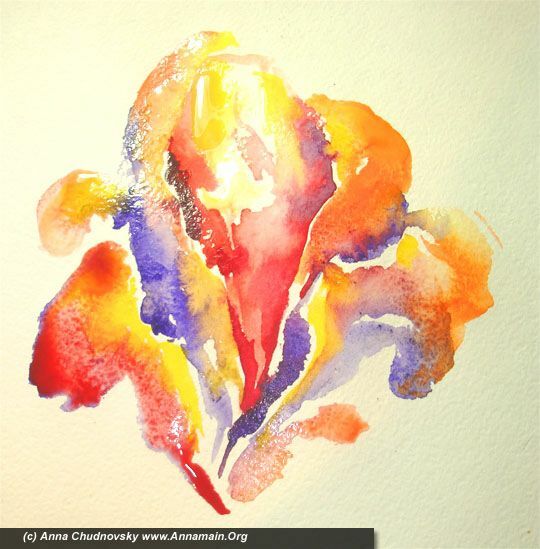 I would like to invite you to that Master Class and to use painting as a power to open slightly your intuition. Well, tht time I want to found why I choose the way of painting. First of all our base mind stands on images, words and logic develops more later. 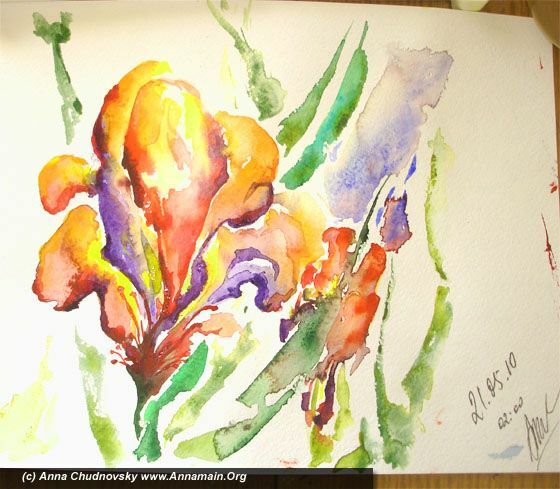 Watercolours is the great symbiosis of light (colours itself), water (our base substance) and action. If you paint with music it becomes a dance. So this is the best way combines all importnt things. 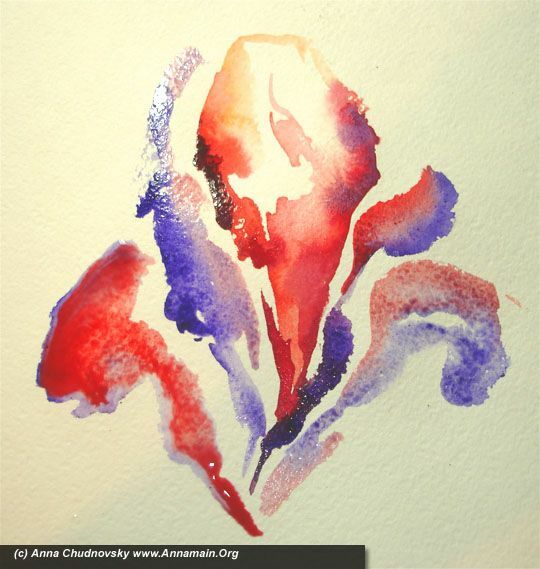 This is no aim to paint a real flower, but a symbol of flowers generally, with colours you choose by your intuition, at any form, with all details you feel. Ok, let`s it blossoms! 1 - as a pearl starts from only grain, a flower starts from a central petal. I choose red colours for it because it`s the best to enter all another colours. You don`t have to create an accurate shape. Let water to provide the colours free. 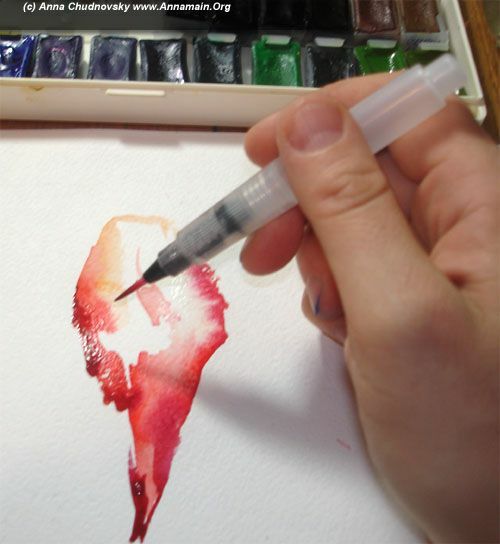 2 - use more water and enter another shadows of red to the petal. 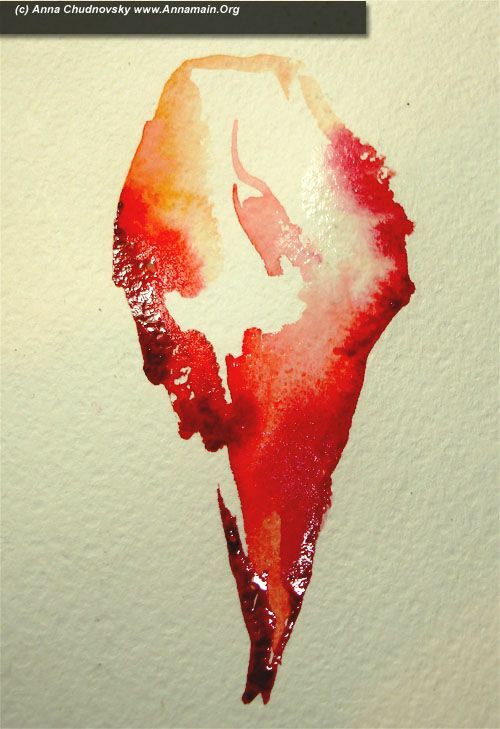 On thet picture you can see how different shadows of red layes ton he paper, how water dissolves or concentrates it. 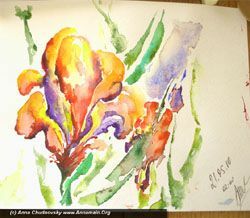 Pay your attantion to provide your painting with water, more water as you can see on the picture. 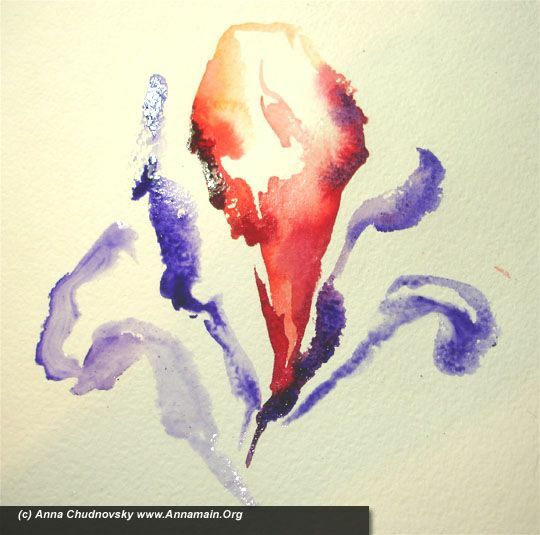 3 - use another colour (for example violet as I did) to paint a brranch petals. Technigue is the same, actually this is no technigue except ‘more water’. As your paper has more relief you can use more water. 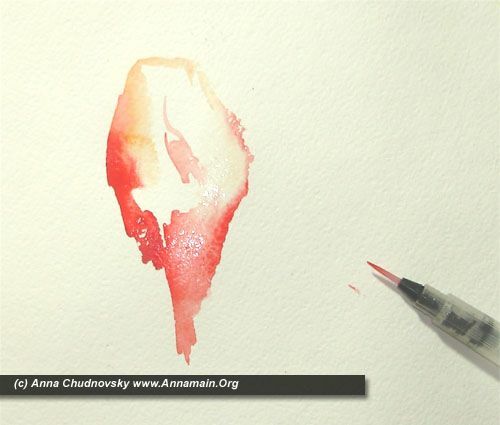 If you use a water-brush it`s more easy, just squize it and enjoy the result. 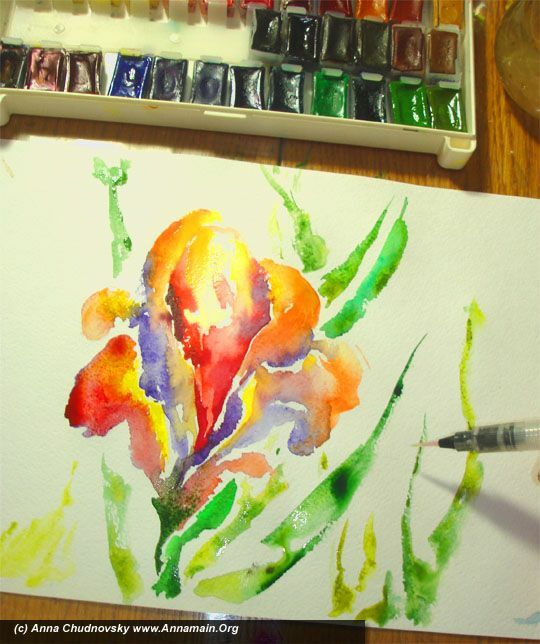 If you use a classical brush you should bring more water on it. 4 - introduce more colours in your picture as you see on the picture. 5 - more yellow light colours. the point is to feel it, how it fade away, how it mixes with another. Let youself to relax. The paper and water will do everything b itself, and you will be a witness of the process. Feel relaxation, feel the process itself, forget about result! 6 - create leafs for your flowers. My intuition recognize my flower as somethinf narcissus so my leafes is sharp and long. Listen to your intuition and paint the shape you want with all colours you want. This is no limitations. But feel everything you want to do, feel it during the process and use enought water. 7 - more leafs with different colours! Let youself to relax. 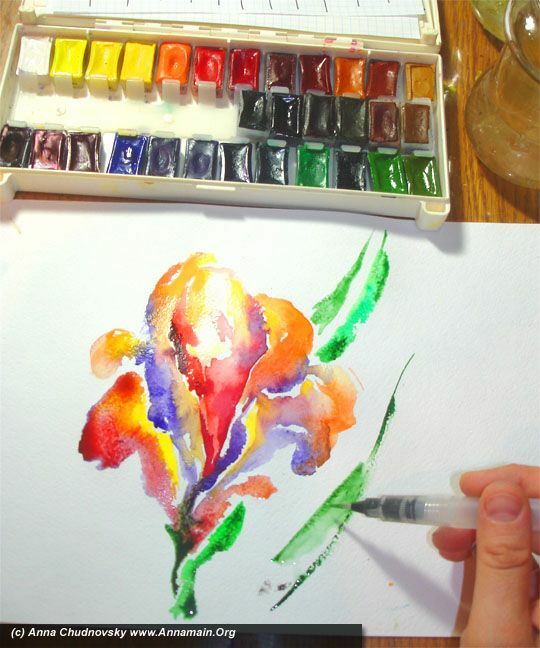 If you feel a desire to drop your brush and paint by fingers - do it! 8 - until your colours is wet create more buttons or flowers as you wish. That way everything is possible, everything is right. Do it until your picture is wet, use more water and feel it, feel it, feel it… That way your intuition becames contrillable and availiable for you without of rationality loses. When your picture becames dry you can feel how something fine disappears with water. With water you can literary touch the space of possibilities and change everything, but dry picture becames a history, a fact of the past. As you feel the differencies between such two states and place both to your experience you can be a master of intuition and rationality both. This is the true gift and the real result of that Master Class. I can prove my position by own experience and I feel this is my destiny to teach how to make both ways with double advantages availiable for every person wants to develope. It`s possicbe and could brings your fresh energy, relaxation, better decisions, better quality of life. I need to plant flowers outside the window of a depressed person’s room. I was wondering if there is a kind of flowers that blossoms in all four seasons?